Cryptocephalus decemmaculatus, copyright Stanislav Krejčík. The Cryptocephalini are a group of leaf beetles whose larvae feed on dead leaves accumulated on the ground and protect themselves within a case composed of faeces and debris (Lawrence & Britton 1991). [BN04] Baselga, A., & F. Novoa. 2004. La colección del Museo Nacional de Ciencias Naturales (Madrid) de Cryptocephalus Geoffroy, 1762 (Coleoptera, Chrysomelidae) de los grupos de C. sericeus (Linné, 1758), C. hypochaeridis (Linné, 1758) y C. violaceus Laicharting, 1781. Graellsia 60 (1): 95–99. [ES06] Erber, D., & M. Schöller. 2006. 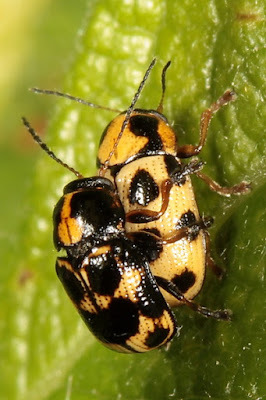 Revision of the Cryptocephalus-species of the Canary Islands and Madeira (Insecta, Coleoptera, Chrysomelidae, Cryptocephalinae). Senckenbergiana Biologica 86 (1): 85–107. [J89] Jacoby, M. 1889. Viaggio di Leonardo Fea in Birmania e regioni vicine. XVII.—List of the phytophagous Coleoptera obtained by Signor L. Fea at Burmah and Tenasserim, with descriptions of the new species. Annali del Museo Civico di Storia Naturale di Genova, Serie 2a, 7: 147–237.